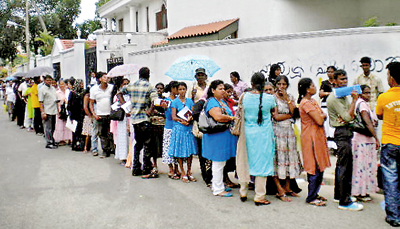 A major racket involving Sri Lankan housemaids, brokers, and errant Arab recruiting agents is threatening the image of the foreign employment trade and could hurt business, the industry warned yesterday. Faizer Mackeen with the Association of Licensed Foreign Employment Agencies (ALFEA) said rogue brokers are making millions of rupees at the expense of unsuspecting Arab sponsors and the image of the country. He said brokers are known to tour the rural areas of the country and recruit women for overseas postings as housemaids and in return their families are offered something like Rs. 200,000 prior to the woman’s departure from the country. All the woman has to do in return is to run away from her sponsor after completing three months in employment and arrive at the Sri Lankan Embassy where she could obtain an exit pass and return to the country, he said. 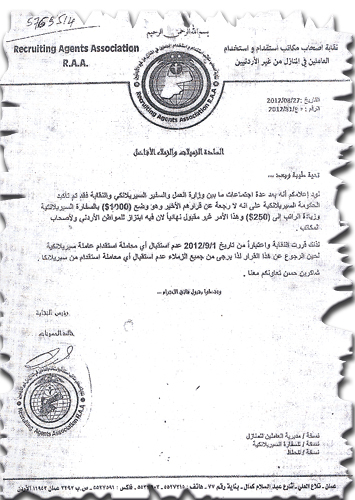 “Thereafter the handler (broker) makes another fresh passport and the same procedure is maintained while another Arab sponsor is cheated,”Mr. Mackeen added. He also added that in many cases the brokers run away with the money meant for the worker’s family never to be seen again and then the recruiting agent is pestered to bring the woman back. In the most recent case a man who sent his young wife to work as a domestic in an Arab household in Saudi Arabia in exchange for a commission fee is now seeking her immediate return to the country claiming that the recruiting agent had defaulted in payment. 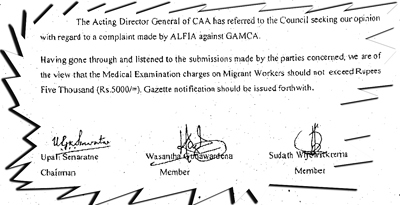 ALFEA Secretary Faizer Mackeen alleged that the man had made a false complaint to the SLFEB claiming his wife was being ill treated by her Arab employer and was urging that she be brought back to the country at the expense of the recruiting agent. “However this is not the case. The recruiting agent had handed over a fee of Rs. 200,000 to the broker to be given to the woman’s family but now the family claims it did not receive any monies and is demanding the woman be brought back to the country. “The broker is also the man’s elder brother and the entire story has been engineered by the pair,”Mr. Mackeen said. He added that the woman had been in employment with her sponsor for the past seven months and there had been no earlier complaints. “It appears that there was a plan to bring the woman back and send her again to a different employer where once again money will exchange hands,” he said. “This is not the first time such errant brokers have been caught in swindles of this nature. There are hundreds, if not thousands of similar complaints piling up at the SLFEB but little has been done to rectify the issue, while the image of the industry is seen in poor light,” Mr. Mackeen added. SLFEB Chief Amal Senadhilankara said there were hundreds of such cases and it was difficult to search for the genuine complaints. “However we have now taken up the position to be extremely strict with the recruiting agencies on complaints where maids are being harassed, in a bid to arrest this trend,” he said.